Eastern coyotes are visually comparable to German Shepherd dogs, but are generally about half the weight. They are recognizable by their bushy tails and large, pointed ears. Their coats can vary in color, but are generally blonde or reddish blonde, tan, or mixed with black. 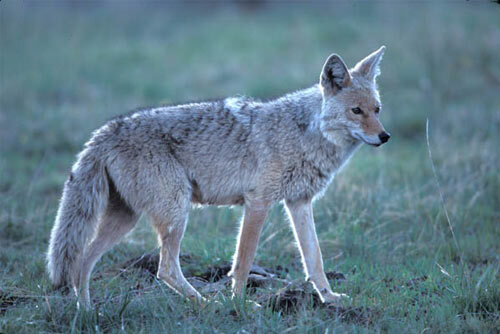 On average, adult coyotes are between 4 and 5 feet long, and weigh between 35 and 45 pounds. As with many other species of mammals, male coyotes are typically larger than females. Coyotes eat a variety of different plants and animals, including deer, rabbits, mice, raccoons, groundhogs, birds, insects, and berries, depending on what is most easily available at any given time of year. As wolves were driven out of the Adirondacks, it opened the door for coyotes to fill that vacated niche. Some researchers speculate that the presence of coyotes in the Adirondacks pre-dates Europeans settling in North America, others believe that the species initially inhabited the mid-west, and naturally passed north of the Great Lakes and into northern New York as deforestation subsided. Coyotes were originally documented in New York State in the 1930s, and the population has been significant throughout the state since the 1970s. Unlike wolves, coyotes don't establish true "packs" with other adults, and instead travel in "family units". Coyotes are extremely territorial, and therefore are unlikely to cross into the territory of a different family. The DEC reports that a SUNY College of Environmental Science and Forestry study "estimated that there are approximately 14,500 breeding pairs of coyotes in New York during the summer," and identified coyote density estimates as being around 2.5 pairs/10 square miles in the Adirondack Mountains and St. Lawrence and Mohawk River Valleys. This density decreases to 1 breeding pair/10 square miles in the Lake Plains. Although coyotes have historically preferred wooded habitats, they do inhabit suburban and urban areas at times. While the species is not known for aggressing humans, they do pose a serious risk to domestic pets.